COMMUNITY ROOM | In 2016 we identified an old disused room within the estate as an ideal venue to facilitate future community projects. The room was spacious and was located in the heart of the estate. After several emails and phones calls to the Southwark Council, the TMO finally acquired the community room. The community room was in disrepair and required total refurbishment i.e. Flooring, Ceiling, Windows, Decoration, Electrical, Heating. We were able to secure funding from the People’s Health Lottery and also Southwark Council. Works to completely refurbish the community room began on the 11th April 2017 and is estimated for the works to be completed by end of July 2017. The aim of this project was to have a community room that has a warm, friendly atmosphere which can be used for a wide range of activities for the whole community. The community room would be used to enhance people’s lives though improving their social, physical and life aspirations. Some of the activities we plan to enroll in the community rooms are computer lessons, fitness sessions, bingos, quizzes, book clubs, kids activities room, residents meetings, youth projects, CV building sessions and a host of other beneficial projects to the local community. We believe that the community room will tackle issues of social exclusion within the local area and develop community cohesion. Like London, D’Eynsford Estate has a makeup of vibrant, multicultural residents of differing age groups, ethnicity, and backgrounds which has always on previous occasions shown a good community spirit. However, we were aware further works is required to develop this and therefore see the Community Room Project being instrumental in achieving this goal. This community room has the potential to have a huge positive impact on hundreds of lives in the local area as well as address issue of people suffering from isolation and depression. We have a vision of making D’Eynsford Estate, Camberwell and London an even greater place to live in then it already is. From January 2018, we will be hosting the following classes in the community room. 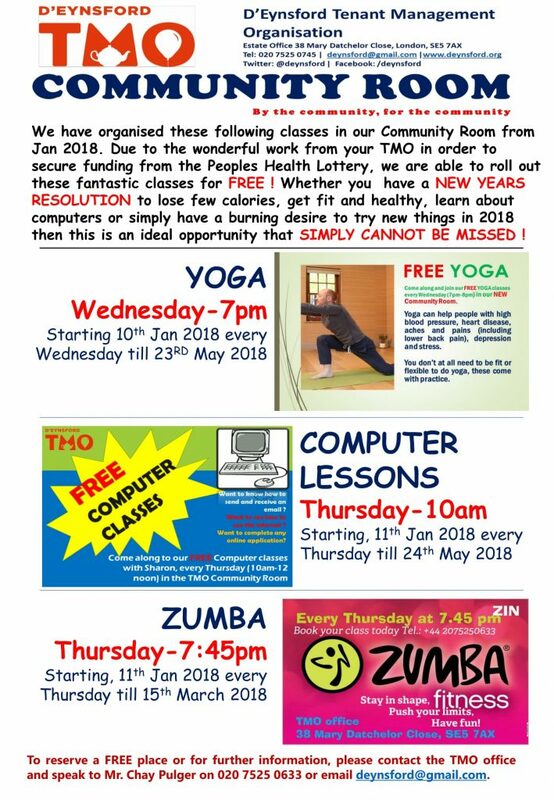 Due to the wonderful work from your TMO in order to secure funding from the Peoples Health Lottery, we are able to roll out these fantastic classes for FREE ! We are also planning various other activities for residents, such as board games, film nights, etc. Please check our website and the notice board for information. We understand that there are going to be some residents or organisations wanting to hire our community room. Currently it is only available for public hire during Monday to Friday from 9am to 5pm. If you would like further information then please contact the TMO office and speak to Chay Pulger on 020 7525 0745. *We may ask for proof of status of charities and non-profit org. Use of the community room, toilet and kitchen. Also included in hire of all rooms is use of tables and chairs (large and small). Once we receive the form, an invoice will be sent to you. Finally, enjoy the use of the ROOM. If you have any questions, then please contact us.